Many New Jersey personal injuries are caused by accidents involving automobiles, trucks or motorcycles. According to federal government statistics, someone in the United States is involved in a motor vehicle accident, or “MVA,” every ten seconds. There are many facets to a motor vehicle injury case, and it is in your best interest to have expert legal assistance from a qualified New Jersey car accident lawyer helping you at every stage. If you are injured in an accident involving a motor vehicle, your medical bills are ordinarily submitted first to your own automobile insurance company as a part of the personal injury protection (PIP) coverage (or in some cases, the “Extended Medical Benefits” a/k/a “MedPay” provisions of your policy). Your health insurance ordinarily does not pay for treatment of injuries suffered in a motor vehicle accident, unless you have selected the “Health Insurance Primary” option on your automobile insurance. If your auto insurance company denies your claim and you want to contest this denial, you must take your claim to arbitration. A New Jersey auto accident lawyer who is knowledgeable in motor vehicle insurance law will present your case to the arbitrator and help you receive the benefits you are supposed to receive from your insurer. Prompt legal assistance will also help you with the other aspects of your New Jersey injury case. For example, if you have been injured by a government motor vehicle, you must present your claim for damages within 90 days of your injury. If you do not, you may receive nothing. A permanent injury, other than scarring or disfigurement. If you cannot prove that you have suffered one of the injuries above, you may not recover for your pain and suffering. Larry M. Pollack, Esq. is a New Jersey auto accident lawyer who knows how to work with you and your physicians to find out if your injuries meet the minimum thresholds for pain and suffering. Early investigation and knowing what needs to be proved is essential to establishing that the thresholds are met. Your injury case may also involve questions of insurance coverage. Perhaps the motorist who caused your injuries does not have insurance or does not have enough insurance to compensate you for your injuries. Perhaps that motorist’s insurer has denied him or her coverage for some reason – even no reason – as in the case of a bad faith denial. Larry M. Pollack has represented clients in claims made directly against their insurers. 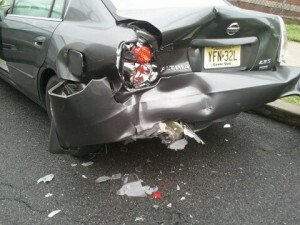 You may be the victim of a hit-and-run accident and never know the identity of the motorist who caused your injuries. Coverage may be possible from the New Jersey Unsatisfied Claim and Judgment Fund (UCJF), and Larry Pollack is a New Jersey auto accident lawyer who knows how to bring claims before the UCJF. Many of his successful cases have involved the Fund. Larry M. Pollack, Esq. has handled numerous motor vehicle accident claims, and knows how to get his clients the compensation they deserve. He has represented many satisfied clients over the years, and will treat your case with the time and attention it deserves. Contact New Jersey car accident attorney Larry M. Pollack as soon as possible after you have been injured to discover how he can help you in your time of need.